You know those really action-focused reads that inexplicably turn into these action-packed movies inside your head the moment you start reading? Well, this is one of those. The mastery of the word is there, ringing of my childhood tales, ringing of forgotten times with heroic battles that were provoked by now dusty reasons, like the moral need to avenge your loved one’s death and to `repay’ the wrongdoing that has been done. I dunno how you guys would name that sort of story, where the good guy is brave, and determined, and he struggles with whatever fate he’s been dealt but valiantly makes it through any and all ordeals; he encounters supernatural beings, often as enemies but also as aids, he uses their help, helps them along the way, and someway, somehow, it all weaves into a path that leads him to where he aught to get to; the pure, righteous, brave one always is wronged, but he always fights back and struggles until he gets what he wants…and the ladies are always fair, and sweet, and gentle, and they end up with the hero in the end. Those kinds of tales fascinated me throughout my childhood, for many, many reasons, and they still do; the art of the word gives them something truly magic, something that few are able to achieve, making them timeless works of art. 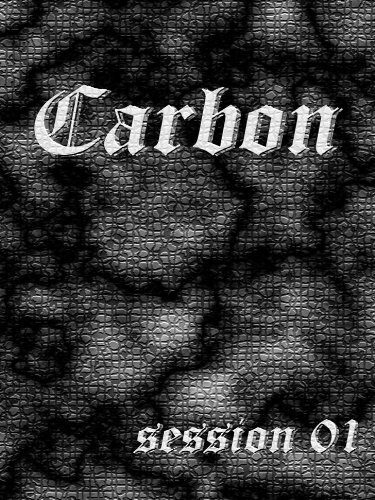 Well, that sort of magic, that sort of artful word that flows right into your imagination and makes a crystal clear movie of it all inside your head I’ve found in Carbon: Session 01 – Alignment. The writing is, in my humble opinion, a very strong point of this series, if it’s kept in this artful and stylish form. Scattered throughout are a few lovely images as well, and let me tell you, as the very visual person that I am, I love to be given those. I mean, sure, I can imagine the character, I will have fun doing it, but give me some hints so my mind won’t go astray with it. The small, beautiful sketches here give you enough detail to have a clear picture, but not as much as rendering your own imaginative process minimal. I love the way the setting is put up, the characters feel well built, giving you a clear sense of who and what they are even if the read in itself is really not that large, we’re talking about an introductory piece of the story after all. I will say, as the anime-lover that I am, that me watching the Bleach series might have had a great influence on my perception of this little darling. If you’ve seen Bleach episodes, love the fighting and the pace of the action in it, you will love this as well, I am most sure. It’s got that same kickass slash cool slash fairytale flavor to it; it’s not easy to achieve such a visual degree of story-telling with masterful words, and I applaud the authors for achieving it – for me, this makes or breaks this kind of read.